Tangled is the latest Disney offering, giving a new twist on the classic tale of Rapunzel. I must admit, I only halfheartedly wanted to see it. From its oft-played trailer, I got the impression that it was going to be another mediocre animated feature with pop culture references. Ah the cynicism of our after-Shrek era. Well I'm pleased to tell you that the trailer doesn't do the film justice. Our heroine (voiced by a wonderful Mandy Moore) is locked up in a tower by Mother Gothel (Broadway diva Donna Murphy) because of the healing powers of her golden locks. She meets the thieving Flynn Rider (Chuck's Zachary Levi) when he becomes a tower intruder trying to evade the long arm of the law. Using a frying pan to convince him, she strikes a deal with the good-looking and dashing bandit for him to become her guide to the outside world. In a very funny sequence, they find themselves in a big production number at a pub with characters like Hook Hand Thug (Brad Garrett) and Big Nose Thug (Jeffrey Tambor). The film also features Ron Perlman as one of the Stabbington Brothers, Flynn's partners in crime. Maximus the horse, who for all intents and purposes, is a dog, is hilarious. He's like Les Miz's Javert in his single-mindedness in capturing Flynn. Rapunzel's sidekick, Pascal the chameleon, is wordlessly entertaining. Even the frying pan has a life of its own. While this is Disney's first CGI fairy tale, it's refreshing to see them mix new and old. They again use music to help tell the story (which they revived in last year's The Princess and the Frog). Alan Menken even wrote the music. Watch out for Donna Murphy's show-stopping "Mother Knows Best", this movie's "Poor Unfortunate Souls", where she effectively and brutally guilt-trips her daughter/captive into staying. Gothel is a Mommie Dearest maternal figure, feigning love while insulting and manipulating her teen-aged prisoner. Through Mother's obsession with age-defying tactics, Disney also takes a swipe at our society's preoccupation with youth and beauty. The film is a wonder to look at. Her luxuriant hair, realistic water, lush nature scenes, dazzling and colorful storybook background---a glorious visual feast. This is classic Disney: charming, fun, heart-warming. I was happy to see that John Lasseter also served as executive producer on this one (like last year's Frog). 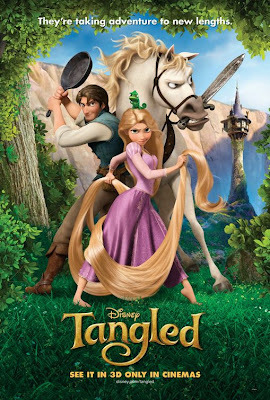 With Tangled, Disney magic is back again this year.